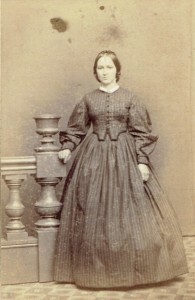 I can date the photo from her dress and hair style, as well as the pose and props often used by photographers of the time, but there is no indication of place or photographer. I can gain a certain amount of information from a close inspection of the card, but I cannot find her name, nor determine why her photo is in my family’s collection. She is just one more unnamed figure in a photograph. There are more than a hundred such photographs in my family albums, all unmarked and unremarked upon. Current wisdom says we should identify the people in our photos, but aren’t we all victims of the “Of-course- I’ll-always-remember-who-these-people-are!” kind of procrastination, only to realize years later that we have failed, leaving a frustrating mystery for our descendants? The photos of generations past are fascinating, whether of ladies in fine gowns, soldiers in worn uniforms, or families sitting so still in their “Sunday best.” Their stories are untold and silent, and I keep turning the album pages in hopes of finding a name on the next page. And I just find more figures in the photographs. As the genealogist of my generation, I label everything I can. The most frustrating thing about family treasures are the innumerable unlabeled images dating back 100 years or more. One album I have has about 6 of the 50 images labeled with names in my grandmother’s handwriting. I assume that even she had no idea who the others were! She lived 1886-1964. I have an album that clearly belonged to a gg grandfather. The first two pictures are of him and his first wife. 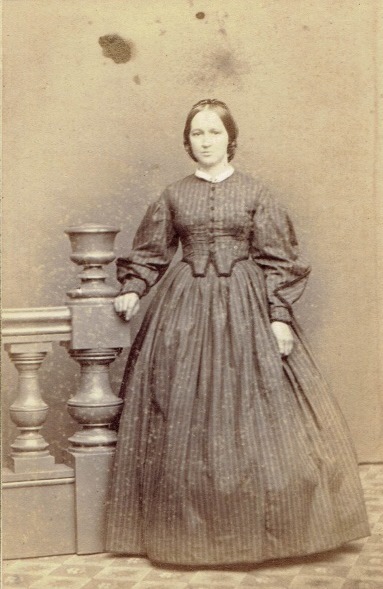 That pretty much dates the album, because she died in Monrovia, Liberia, where they were missionaries, in 1850 (along with their only child, a toddler, of whom I have no picture). But more than half of the pictures are unlabeled, so I assume he knew who they all were and thought he always would. The latest ones are from the 1880s, judging from the clothing. Others include his second wife, my gg grandmother, and their four surviving children, as well as their first grandchild. Some include his students from a year or two he spent teaching in the 1830s, and many clergy colleagues. Others include friends, since the names mean nothing to me. A couple are labeled in other hands, which I suspect is that of his granddaughter, through whose hands the album passed before going to my father, then me. I’ve since learned some of her identifications are wrong. Still, this album is a treasure, in spite of the holes in the identifications. By comparing them with those held by relatives, I’ve slowly filled in a few. My real frustration, though I’ve had to let it go, is several boxes of unlabeled pictures that piled up in a house my Norwegian immigrant grandfather lived in for forty years. My sister then bought the house from his estate. Once when I visited, she and my mother went through the boxes. If they didn’t recognize people, into a garbage bag those pictures went. Over my heavy protests, because at that point my mother still had living cousins in MN and WI, where the family had lived when these pictures were taken. I don’t think I was able to rescue a single picture from that stash. Heartbreaking. So now I really try to label all my pictures, and go back to label what I can. The flip side of the dilemma of unlabeled photos is what happened when a cousin let her mother and an aunt loose on a pile of old, unlabeled snapshots and several priceless studio portraits. Mom was in a nursing home and the idea was to have her label photos from her childhood to occupy the hours between meals. Big mistake! Cousin had provided Mom with a package of file folder “sticky labels”, with specific instructions to place them on the BACK of each photo. Instead, she and her sister stuck the labels on the edge of the front of each photo. Their reasoning being to save a viewer having to turn a photo over to know who was in it. In the case of the studio portraits, they placed the labels over the engraved name and location of the studio, which stuck to the labels no matter how carefully Cousin and I tried to remove them, meaning the information was lost forever. That said, I’ve also become something of an expert in “forensically” identifying unknowns by comparing facial features, whose distinctive characteristics are inherited and don’t change as a subject ages, to other (labeled) photos of members of whatever family we suspect the unknown belongs to. This has saved many old photos from the “Unknown” pile. This one really tugs at my heartstrings. I collected (copied) old family photos from distant cousins for years, and many are not identified. Two examples: (1) A tiny album of gem tintypes that a cousin of my great grandfather gave to my grandmother “because they’re your people.” None are labeled, but I could identify one on the front page as my great great grandmother as a young woman. The man facing her also on the first page is probably her husband, and does have a family resemblance, but no proof. The same couple (separate pictures) appear further inside. Does this repetition indicate the original owner? (2) A lone tintype of a middle aged woman that was given as part of an inheritance to my uncle by the aunt who raised him, along with some other more recent pictures. 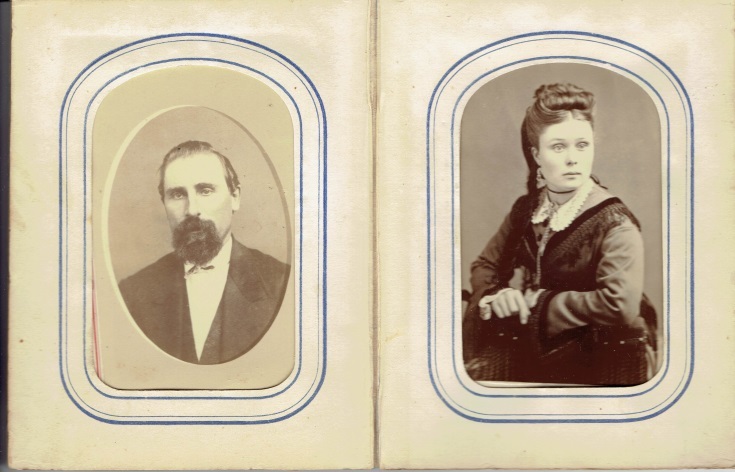 There is no woman in the direct ancestry of this family (from the 1870s) that has not been photographically identified–except for his great grandmother who died in 1876. Why else would it have been given to him? I sooo want it to be her, but I have no proof, just the circumstantial evidence. If I could have dinner with anyone from the past, it would be with a couple great great grandmothers–and I’d bring all those old photo albums! One thing I did before my Grandparents passed away was to make sure I copied all their photos and had them tell me who the people were. We will have at least one copy of the picture with the names on them. You could see if there are duplicates in other relations pictures that might have their name on the photo. Having found a few relatives on sites, we have started to compare photos and we have been able to make few, sadly, too few, identifications of some mystery photos. I had some marked that they did not and they had the same and we were able to share what was on the back of the photos. I do all I can to share the photos that I have as I find that they are a wonderful way to see what traits are passed, and I also find that there are friend photos in the mix, which can be confusing as who is a relative and who is a friend! All you people!! At least you HAVE pictures! I think there may be lots of us who wish we had some pictures to puzzle over. A few years ago a gentleman in Porter County, IN, contacted me regarding an album he had bought at an estate sale. He was going to use the vintage photographs to decorate his home office, but found about half were labeled and tracked me down through a Rootsweb name page, sent my the album free of charge, and would accept no gift in return! The great blessing to me includes the only photograph I’ve ever seen of my great-great-grandmother, the only one I’ve seen of my great-grandmother’s brother and his bride, and the youngest I’ve seen of my great-grandmother! The vexatious part is two-fold: many labeled photographs, but I have no idea how these folks we related (by blood or friendship) to my line, and many photographs that are unlabeled. These seem to cover the era from about the 1860s to the early 1900s. Still trying to do some detective work off and on regarding the labeled ones! Great article and comments. I worked at NEHGS for many years and during that time my grandmother was over 100 years old. Everyone encouraged me to interview her, which I did and get her to identify as many photos as she could, which I also did. she lived to be 107. I LOVE finding her handwriting tucked in a silver bag with a spoon ‘your great great grandfather’s baby spoon’ or the like. I don’t ever forget how lucky I am to have so many photos and family heirlooms that are labeled and still in the family. As well as a very rich documented Yankee heritage! In my business now, I clean out houses after people have died and I have found countless boxes of photos … which I save for the families … many who tell me to take them away because they don’t know who the people are. It is heartbreaking to me that they don’t even want to keep them … but alas, there are plenty of antique/crafting enthusiasts who buy them. The ones I have of my family members are put out for people to see … on a shelf, in my daughter’s room where the great-great aunt that she was named after is perched on a shelf. I love to make those connections and make pepole think about where they came from. I too inherited several CDV albums and Daguerreotypes some with names many with out I’ve been carefully digitizing then and collecting them in folders based ont he period and/or the photographer. There a website dedicated to posting these types of photos and sometimes you get lucky. I am forever the optimist and the labeler of all things. If you do this long enough you will find someone else who has seen a photo or has a copy. I was able to locate several male relatives by cross referencing their college or university year book, tedious but also rewarding. Such a teachable moment: What will our descendants have from all our digital images 2 or 3 generations from now? Be sure you do the tedious work of including metadata on the images you keep, and mark it on prints that could survive you. Just sayin’.